Waffle, considered to be Belgium’s “culinary gift to the world” is no longer a plain and simple dish as it originally was. It has found its variants across the world and is served either with strawberries, maple syrup, whipped cream, chocolate syrup, sometimes frozen, at others, freshly cooked. 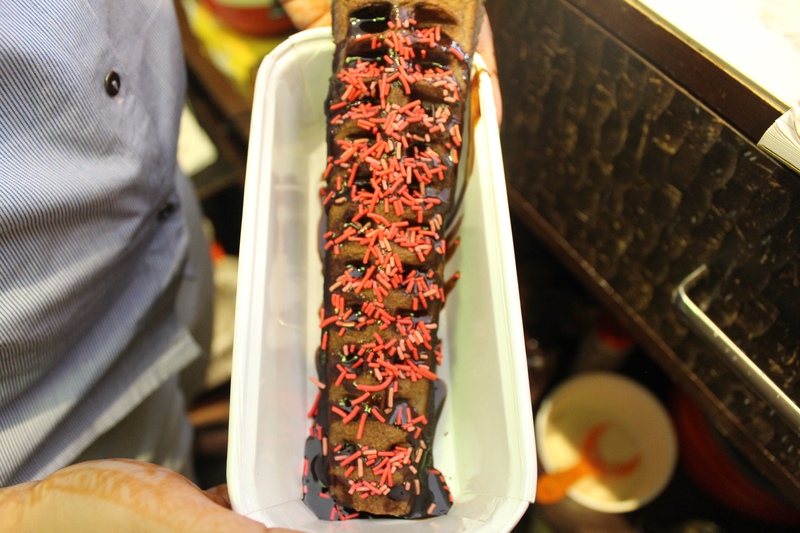 But, have you ever had a chocolate-laden, waffle on a stick? In Delhi, one can find multiple outlets selling waffles, each trying to outdo the other. The Waffle Baker, a newly opened outlet in GTB Nagar area has gone a step further. Situated on Hudson Lane, in the midst of North Campus’ food hub, this waffle place offers waffles with a variety of toppings like Nutella, chocolate, Gems, and also ice-cream on the side. 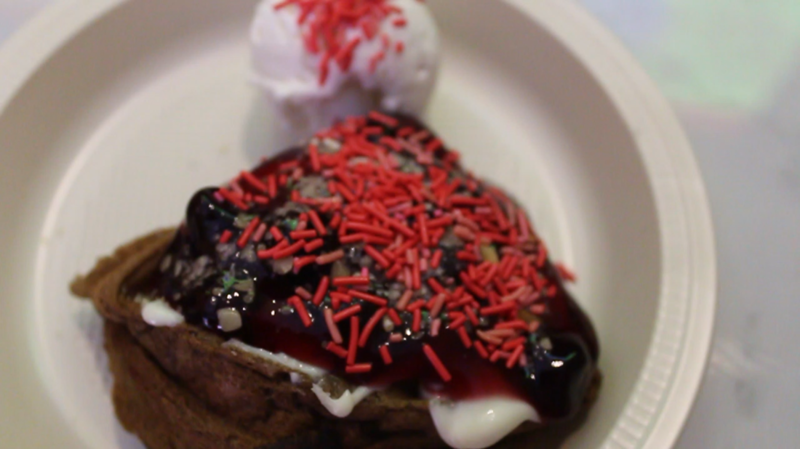 Their much-loved waffle and an especially innovative one is the Berry Express which is served with a topping of Magic Pops. The Waffle Baker’s rampant popularity is due to their ingenious idea of serving waffles on a stick. These waffles are made without using any eggs and the batter is prepared by them, without the use of any machine. The end product is, absolutely delicious waffles with the perfect amount of crunch, which are then dipped in chocolate sauce or topped with a dash of colourful sprinkles and served to you with a smile. The place is quite small and lacks proper seating, therefore an, even more, reason to go for waffles on a stick. They are not that expensive and the quality that you get makes it a bargain. One also has the option of creating one’s own waffle, customising it according to liking. This outlet also serves coffee and various shakes, a lovely combination with a waffle. This place opens around 11 am and is easy to reach, the nearest metro station being GTB Nagar on the Yellow line. This year, The Waffle Baker is trying to make waffles on a stick accessible to the wider public by presenting them at the NBT Flavour Fest- Street Fusion Food Court taking place at Baba Kharak Singh Marg on the 14th and 15th of October. The festival is curated by Delhi Food Walks and aims to bring to the forefront the talented minds behind the various fusion food items.